Nearly half the nation's states are opting not to expand Medicaid to all of their low-income residents, leaving billions of federal dollars on the table and millions of poor Americans uninsured. 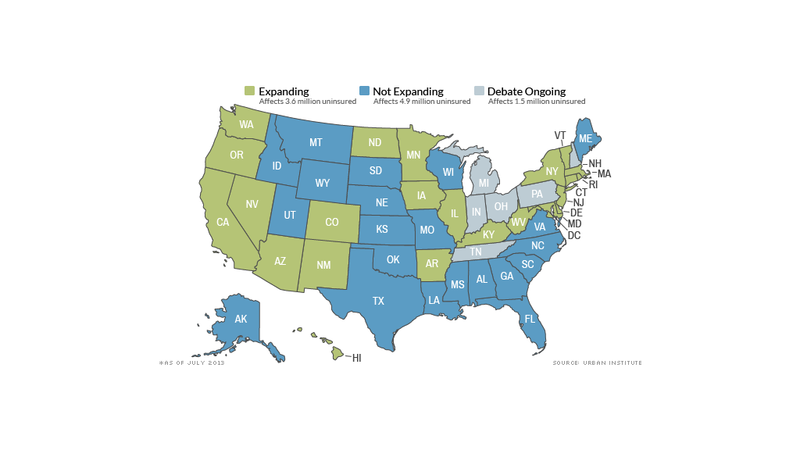 At least 21 states are opting out of Medicaid expansion for next year. In another six states, legislators are still weighing their options, according to the Kaiser Family Foundation, which is tracking the states' plans. The Supreme Court changed the Obamacare rules last June when it decided that governors and lawmakers could opt out of widening their Medicaid rosters. Under the original health-care reform law, all those earning less than 138% of the federal poverty line, or roughly $31,800 for a family of four, would have been eligible for Medicaid. Medicaid rules currently vary from state to state, but many states provide little to no coverage of childless, non-disabled and non-elderly adults. Some governors have said that expansion would involve additional costs that they couldn't afford and enlarge a program that they consider broken. In many states, however, various analyses show that states would stand to gain millions of dollars by expanding the program, at least initially. Take the 14 states that were quick to declare they would not expand. They will lose a total of $8.4 billion a year in federal payments in 2016, according to a June report from Rand Corp. While states will need to cover a portion of the Medicaid costs after that, they are likely to make it up through new tax revenue spurred by the additional federal spending, according to Carter Price, co-author of the report. In Michigan, a report by the University of Michigan and Blue Cross Blue Shield of Michigan found that the state would save about $1 billion over 10 years if it expanded Medicaid. Most of the benefits come in the early years, with the state having to shell out funds starting in 2020. Though Michigan's Republican Governor Rick Snyder pushed hard for expansion, his peers in the state legislature blocked it. Different researchers included different measures when estimating savings in their states. Some stuck purely to the payments from the feds, while others looked at savings from reducing state programs aimed at the indigent, such as mental health counseling and substance abuse treatment. And some looked at the indirect benefits, such as the additional jobs and tax revenues likely to come from higher federal funding. "You can't make an economic case against expansion," said John Holahan, a fellow at the Urban Institute. In Virginia, state officials estimated the state would have to spend $137 million over 10 years were it to expand Medicaid. But if you take additional tax revenue into account, that figure shifts to a savings of $555 million, according to a study by the Commonwealth Institute, which advocates for low- and moderate-income Virginians. The state has opted not to expand Medicaid at this time, but established a committee to study it further. The financial benefits spurred several GOP governors, including Rick Scott in Florida and Jan Brewer of Arizona, to break ranks with their peers and endorse Medicaid expansion. Brewer was successful, but Scott was stymied by Republican legislators who refused to adopt the program. Medicaid expansion will take place in the GOP-led states of Nevada, New Mexico, New Jersey, Iowa and North Dakota. It remains questionable in Ohio, Indiana, Pennsylvania and Tennessee. Conservatives are unswayed by the argument that states will benefit from increased federal spending. "Expanding Medicaid is not the path to economic growth that anybody should want," said Joe Antos, a health care scholar at the right-leaning American Enterprise Institute. "It's an inefficient way to create jobs. There are a lot of better ways to stimulate the economy." Also, Antos points out, the states themselves will not receive the federal funds. The money will be given to hospitals and providers, but after 2016, states will have to start contributing their own funds to the program. What happens to impoverished citizens in states that don't expand? The most likely answer is that they'll slip through the cracks and remain without health insurance. As it stands now, an estimated 11.5 million uninsured, non-elderly, poor adults live in states that have opted out, according to research from the Urban Institute. State officials can change their mind and join the Medicaid expansion in the future. But next year, many poor Americans will not be able to participate in Obamacare. "They are giving up significant federal funding and the chance to cover their neediest citizens," said Kathy Gifford, managing principal at Health Management Associates, a research and consulting firm.